Fall is in the air – the leaves are beginning to change, pumpkins and mums are showing up at the stores, and the overnight temperatures are getting cooler. 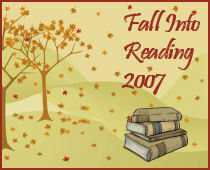 The new season officially begins today, and so does the Fall Into Reading 2007 challenge at Callapidder Days. I’m excited about setting and meeting some reading goals over the next few months, and I’m looking forward to seeing what everyone else will be reading as the cooler days come. This time around I’m going a bit lighter on the non-fiction since I had such a tough time motivating myself in the Spring. This list is subject to addition, deletion, and any other type of modification as I see fit. I’m currently participating in a study of the book of Matthew through Bible Study Fellowship International; the questions and reading required for my class will be my Bible study time for now. If you would like to join in the fun, or to view the reading lists of other participants, visit Callapidder Days. Lions and tigers and bears…and elephants, zebras, etc. Earlier this week Little and I were invited to visit the zoo with my friend Lindsey and her son. We had never been to our local zoo and were excited about the opportunity to go. At first, Little wasn’t sure what the whole point was. We pulled the strollers up to the first exhibit of monkeys (gibbons, actually) and the waterfall at the front of the enclosure caught Little’s attention right away. It took her a few minutes to figure out that we were pointing to the gibbons, but once she did she pointed and grinned as they swung around and played. There is currently a butterfly house set up in one area of the zoo. Little really enjoyed seeing the flowers and watching the butterflies flutter around and fly right past her face. I thought it was neat to see all of the different types of butterflies and the beautiful colors and wing patterns. It is amazing the variation God created on something as small as the butterfly. Most of the time Little seemed a bit ambivalent toward the animals; she would point to them, but she doesn’t really identify them yet. She did get excited when she spotted the animals in their habitats and would point and smile. One of our favorite exhibits was the polar bears and sea lions. The habitat is set up where you can see the bears from outside (like a standard exhibit) but there is also a building you can enter and view them through floor to ceiling windows. The windows look into the pools of the habitats of both the polar bears and sea lions; you can see the animals up close swimming and diving and playing.Ã‚ It was very neat to see them so close. Little really enjoyed watching the sea lions play because she could see them well as they swam back and forth across the viewing area. We saw all manner of animals from flamingos to butterflies to tigers to bears to elephants. It was fun for me to see the animals but more so to watch Little’s face light up as she discovered new things. For my loyal readers: Thanks for continuing to stop by the last few weeks while posting has been so light. I’m hopeful that I’ll be posting more regularly again before long, but I think it might take a few days to get back into the habit. This week has been all about comfort foods; I’ve eaten mashed potatoes, homemade mac & cheese, and lots of M&M’s. In fact, I’ve probably ingested more carbs than a person should have in a month. Earlier in the week I concocted a tuna-noodle casserole for my lunch. I recognize that a lot of people read that and think, “yuck!”, my husband is included in that group which is why I ate it for lunch. But for me, this is one of my favorite comfort foods, one of those foods that brings floods of childhood memories as I cook and eat it. My Dad and brother don’t like tuna-noodle casserole either, so growing up Mom would make it sometimes when the guys were off camping or both happened to be away from home at dinner time. I always enjoyed it when we ate it at our house, but my most special memories are of eating it with my Ghina and Poppa. Ghina knew how much I liked the casserole, so every few months when they had it for dinner the phone would ring with an invitation for me to join them. This was a special time because it was just me and my grandparents – no parents, no brother, no cousins – a table set for three. Entering the house I was greeted by the sound of the timer on their old-fashioned toaster oven clicking away, the smell of the casserole baking, and the sight of Ghina preparing garlic bread to be toasted. I would hang out on the stool in the kitchen, or write on the chalkboard, or play with a few toys until the timer dinged and dinner was ready. The three of us would take our seats at the table; a family table surrounded by pictures of my Mom and her siblings as children, by mementos of a life lived together for many years. Ghina dished out our dinner. Poppa opened the box of ground black pepper. Slices of garlic toast were passed. A meal was enjoyed. After dinner was finished and the dishes washed, Ghina and I would sit at the kitchen table and play Chinese checkers. If I was lucky we could get in several games before I had to head home to get ready for bed and school the next day. There were many, many dinners like this each consisting of a plate of tuna-noodle casserole, a slice of garlic bread, and a special time with my grandparents. Over the years the occurences have lost their individuality and melded into a composite in my mind. Such a special memory, and it all started with a pan of tuna-noodle casserole. So really, I can only blame the pregnancy “ickies” for a portion of my lack of blogging; the other part would have to do with a lack of blogging material around here of late (or maybe it is just that my mind is unable to process events into even mediocre bits of writing). The most exciting event of the last week would have to be that Little has discovered the joy of standing with her head on the floor looking between her legs. Her new pose never fails to make her laugh. Quite honestly it is pretty funny to see her flipped over like that; add to that the fact that I get to hear that sweet little laugh and it is a pretty fun turn of events. In other news, we actually had RAIN this weekend! For good portions of both Saturday and Sunday we had water falling from the sky in a nice soaking rain. Although we’ve received some rain in the last few weeks it has always been a hard rain lasting only a few minutes so a lot of the water has run off; this weekend the ground actually had time to absorb the watery goodness. I think the grass and flowers (what is left of them) are grateful for a good drink of water. We are grateful that the drought has officially ended, but we are still woefully behind on precipitation for the year. Last but not least, Amy at Crunchy Domestic Goddess is hosting a giveaway for a Tummy 2 Tummy instructional babywearing DVD. If you are interested, click here. And there you have another action-packed and entertaining post. I’m hopeful that I will have something a bit more post-worthy to write about soon. Sorry for two giveaway posts in a row, but really, that’s all I’ve got right now. Steph is giving away a gorgeous Strawberry Fields Forever sling from Rockin’ Baby. Winning this sling would be a wonderful start to my collection of babywearing accessories for Little #2 that will be gracing our household in a few months. Rockin’ Baby has some really fantastic fabric combinations on their pouches and slings; better start saving my dollars in the event I don’t win. Hop over to Adventures in Babywearing for more info on the contest and to see the pretty prize. The last several days have been spent in that lovely early-pregnancy haze of nausea and sleepiness. I seem to have totally lost the ability for coherent thought. For example, last night while giving Little a bath Matt asked me to hand him the shampoo. I sat there a second then started to hand him a towel thinking he needed to dry his hands. He looked at me like I was crazy (and can you really blame him?) and said he needed the shampoo, so he could wash the baby. I honestly thought when he asked the first time that he had looked at me and said “boo”. Yeah, it’s that bad! So, I leave you today with nothing. I just wanted to check in and say that we’re making it around here. Hopefully I’ll be able to put a couple of thoughts together in a coherent way again soon. You are currently browsing the Sidetrack'd weblog archives for September 2007.